THOR is our full-featured scanner for the Windows platform with numerous modules and additional checks. SPARK is his little brother, fast, multi-platform, with far less supported modules. 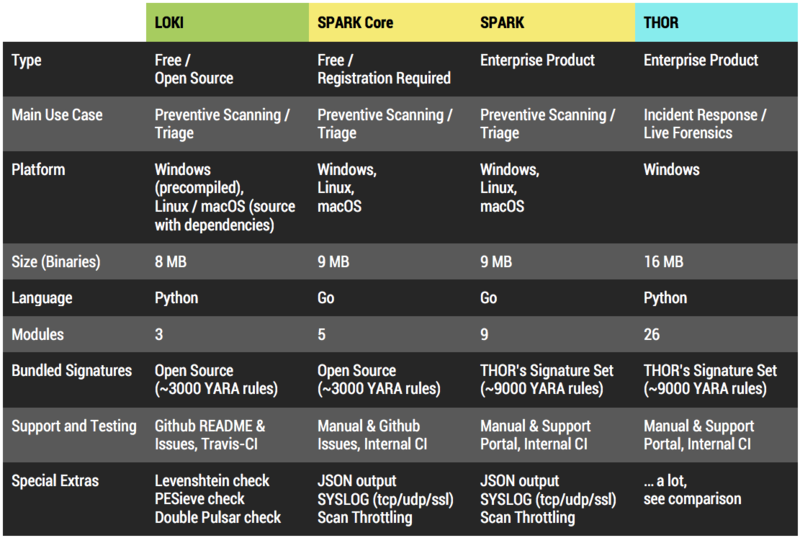 SPARK Core is a new free version of SPARK shipped with LOKI’s open source signature based and a limited module and feature set. Modules and features can be unlocked. LOKI is an open-source IOC and YARA scanner written in Python. Services Checks Analysis of all local services to detect uncommon configurations; service executable location, start type and user account combination, malware names in service image path etc. File System Analysis Analysis of the file system with signatures to identify attacker’s tool sets, common backdoor modifications, hash or password dump files, cloaked executables and much more. Host File Analysis The analysis checks the hosts file for malicious and suspicious entries. Windows Error Report (WER) Analysis This check extracts relevant information from Windows crash reports (Dr. Watson reports) to determine crashes that were caused by exploits targeting known CVE vulnerabilities in browsers, browser plugins and other software. Decompressed EXE Scan Scan a compressed executable in an uncompressed format deflated into memory only. Surface Scan (DeepDive) Analysis of the disks space to find tools that have already been deleted by the attackers. TXT Export Plain text log file of all events reported by THOR. HTML Export Structured HTML Report of all events reported by THOR. Syslog Export Syslog export of the events generated by THOR. This export option is fully flexible. You can define different target ports, multiple target systems, use UDP or TCP and choose between different formats. CEF Message Format Syslog sending messages in Arcsight CEF format to receive warnings and alerts in Arcsight SIEM systems. STIX v2 Provide your own indicators of compromise via STIX v2 documents. The common observables used in STIX will be applied in various checks and modules.